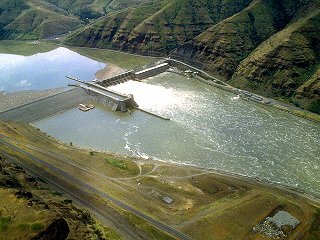 POMEROY - The navigation lock at Lower Granite Dam was placed out of service at about 11:40 a.m. Friday after a vessel entering the lock impacted with the upstream guidewall at the lock entrance, according to U.S. Army Corps of Engineers officials at the Walla Walla District headquarters. After hitting the guidewall, the towboat was intentionally disconnected from the barges it had pushed inside the lock to retrieve the damaged guidewall as it was moving towards the dam's spillway. As of about 5 p.m., the lock was out of service to all commercial vessels and the towboat is holding the guidewall in place. Navigation coordinators have advised commercial lock users of the situation. Lower Granite operations staff are working to secure the guidewall. Representatives from the District headquarters' Engineering and Construction Division traveled to Granite to assess the situation and provide clearance to release the tow. Initial assessments indicate the lock should be operational for lockages at approximately 7 p.m. Friday night. Once the lock reopens, commercial vessels and any recreational vessels which extend more than eight feet above the water will need to provide notification to the Corps four hours prior to arrival for locking due to operational requirements. Corps officials ask vessel operators to avoid coming in contact with the guidewall until permanent repairs are made.